Here are answers to our most frequent questions about the Virginia Opossum. No, but they certainly can look dangerous. If poked and prodded and forced to defend themselves, they’ll bite. But, otherwise, they’re non-aggressive, gentle, timid animals who much prefer to be left alone. If you encounter one, just move away, or let him move away. Opossums may hiss and snarl, and even drool, but it’s a bluff, unless you attack. When they play dead, with mouth open and saliva seeping out, that’s a defense, too. They’re never rabid — their body temperature is too low for the rabies virus to survive. Opossums play dead to fool predators. Many predators lose interest in animals who don’t move. This doesn’t always work for the opossum, but, with some luck, the predator will depart and leave the opossum intact. Scientists say opossums aren’t really “playing” at playing dead — it seems they fall into a comatose state induced by fear. It’s an involuntary reaction. Are opossums as dumb as they say? “They” might be wrong. Opossums have a reputation for being dumb because of their slow movements and small brain size (five times smaller than a raccoon). Yet, owners of rescued young opossums who could not be released back into the wild will beg to differ. They proudly declare that opossums can be litter box and leash trained, love to be held and to snuggle, and greet them at the door when they return home. They also claim the opossums will come when their name is called. It’s extremely rare for an opossum to be rabid. 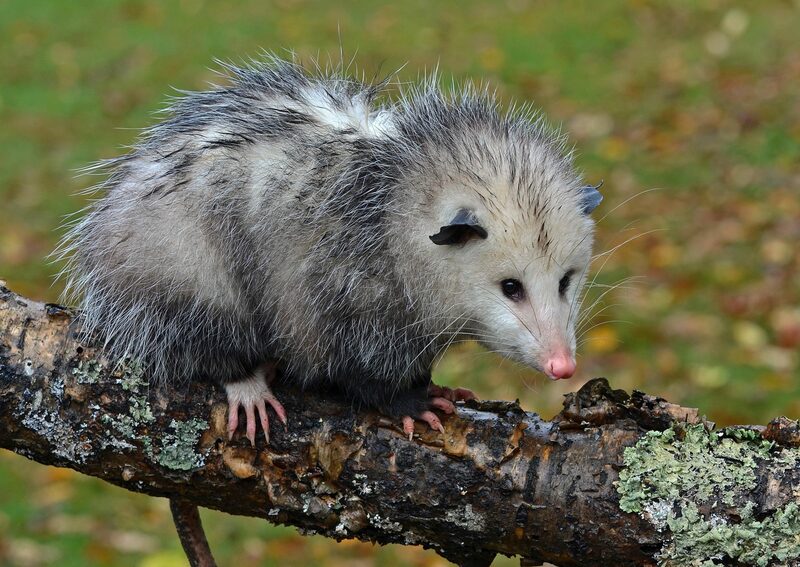 In fact, opossums are the least likely of any wild animal to have a disease. Scientists say this may have to do with their body temperature, which is lower than most other mammals, making it difficult for viruses to survive. Do opossums hang by their tail to sleep? This is a common belief, but it isn’t true. Their tail is “prehensile,” meaning it’s muscular and can be used for grasping. It isn’t strong enough to support the weight of their body for long, however. Some authorities say opossums never hang by their tail, but some people have witnessed it for themselves. Why would you want to? They’re harmless. But, to answer the question, you can’t. Their claws and opposable thumbs enable them to climb just about anything. A fence won’t keep them out. If you trap and remove them, others will take their place. The best way to discourage them is to remove attractants. Don’t leave leftover pet food outdoors. Pick up fallen fruit. Make sure there are no openings under porches and sheds for them to nest in. If you fear them, don’t. They just aren’t dangerous animals unless intentionally provoked. Even when they make a show of anger and fierceness, it’s for show. However, opossums are wild and, like all wild animals, will defend themselves, if necessary. Don’t try to touch. Most opossums are born between February and June. If you find a young one that’s the size of a kitten (not counting his tail), he needs your help, even if he tries to get away from you. Look around to see if there are other babies nearby or even a dead mother. A young opossum will not voluntarily leave his mother until he’s the size of a kitten. Gently pick him up. Wear gloves. Don’t try to feed him. Young ones require specialized diets and very young ones require a feeding tube. They also can easily die from stress, so keep the baby warm and take him to a licensed wildlife rehabilitator. You’ll probably never see an opossum in your yard during the daytime unless he’s a very young one who has fallen off his mother. Opossums are marsupials and their young (between six and 16 at a time!) live in pouches on Mom’s belly for about two months, after which time they climb out and cling to her back for six weeks. Sometimes one will lose his grip and fall off. He’ll be left behind, with the mother unaware he’s missing. Pine squirrels love, love, love their pines!